Buddi is currently available in multiple languages. If you are interested in translating to another language, feel free to do so! I would greatly appreciate it if you also sent me the translated file once you are finished. For more details, please see the translations page. Buddi is released under the GNU General Public License. Since Buddi is released as Open Source Software, everyone has free access to the source code (available for download from the SourceForge project page). This gives you the ability to modify the program if you want it to work a little differently, or if you want to add some new features. 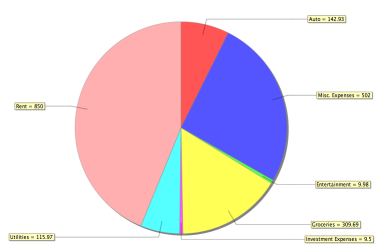 For more information on Open Source Software in general, and the GNU General Public License in particular, you can refer to Wikipedia. This version includes a scheduled transaction offset, and a Croation translation (thanks to Milo for this). A user had encountered a bug in the Income and Expenses report which caused split transactions with specific criteria to not sum properly. 3.4.1.14 is a release to fix this bug. It is recommended that all users upgrade to this version. 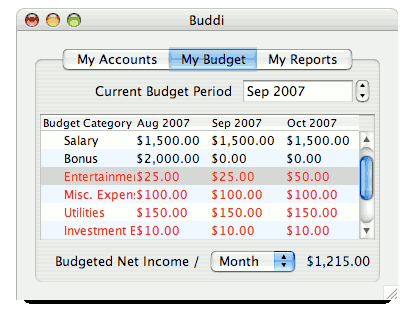 I am happy to announce the public beta version of Buddi Live is now available. In this case, Beta software means that it is not yet feature complete, and there are likely bugs, but the data itself should be stable enough for real-life use (and in fact my own budget has been exclusively on Buddi Live for the past week or so). For those of you who are Buddi Desktop users and have existing data there, the most recent version of Buddi Desktop (3.4.1.7) has been released last week, and includes an export option to generate the Buddi Live data (.json) format. You can upload this file to Buddi Live using System -> Restore. As this is still beta software, I would strongly recommend that you backup your data after each session; I don't anticipate problems which could lose data, but it is always a possibility. You can backup by clicking System -> Backup, and keeping the resulting Backup.json file in a safe place. I am pleased to announce the Buddi 3.4 branch, the culmination of a year and a half of work. Included are the ability to use split transactions, improved interface for budgeting, and many bug fixes.